We arrived safely back in Belfast 10 days ago, and have gotten settled back in after 5 weeks back in Florida. Everyone has greeted us here by saying, ‘welcome back to the cold’! The weather, and returning to the routines of life, is indeed a bit of an adjustment after being away for a period of time like that. We are thankful for the time that was given to us in Florida - the experience of meeting with other mission servants sent out by the UMC, the time with family and precious friends, and the hospitality we received at two churches we hold dear – First UMC, Orlando and St. Lukes UMC in Windermere. 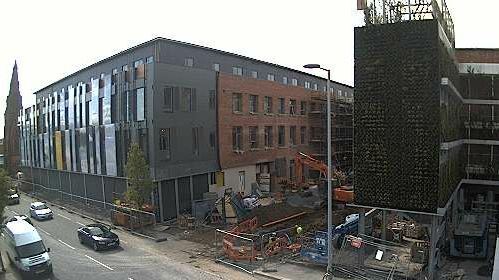 One fascinating thing after being away for a month was to see the progress of the Skainos project while we were gone. On the left side of the picture below, you can see some of the panels that face the road, all of which have been handpainted by a local artist to reflect the different views of the Belfast sky, along with a few splashes of yellow to represent the iconic Harland and Wolff cranes. On the right side of the picture you can see the newly planted vertical garden, which is literally making news (see the article below). What is exciting about this to me is the thought and prayer that has gone into the project over the past 10 years, and now seeing it so close to fruition. A large part of the ethos of this project is that of ‘shared space’ – space that will be open to all in the community – no matter your age, your economic standing, your level of education, or your practice of religion. In a city that has known a large degree of division and segregation, the idea of sharing space speaks to me of the kingdom of God. Paul speaks of how Christ Jesus has broken down the hostility between us – Ephesians 2. In a similar manner, the design of the Skainos site shares the possibilities of both beauty and life in the artwork and the vertical garden along the front of the site. By God’s grace, the activities, projects, and the variety of organizations within Skainos will help bring those possibilities to life in the day to day experience of people here.